Yesterday's much anticipated Fed interest rate increase has done little to change the mood on Wall Street. The FOMC raised the Fed Funds rate by another 25 bps on Wednesday as Fed chair Janet Yellen saw the US economy advancing at a "measured" rate. This is the 2nd time the Fed has increased rates this year and the 3rd time in as many quarters. The announcement was largely anticipated by the market and created very few ripples to the dollar, bonds or equities. The US currency saw a bit of a helping hand to slow its Q1 decline after the dismal US numbers on inflation and retail sales. However, with American unemployment running low and seemingly at full employment, the Fed believes the conditions are right for an uptick with inflation and more rate increases. Short-term bond yields saw a slight rise with 3-month US bills moving up 13 bps for the month. Markets, in general, barely yawned at the increase with the S&P 500 posting another fresh all-time high mid-week. The Dow also experience very little shake-up with the news as it moved to another record level. 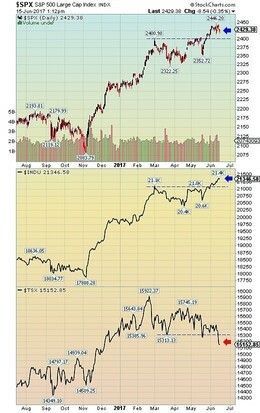 The TSX is not as lucky as the S&P 500 or the Dow. Having almost a 38 percent weighting in natural resources, any uptick in the US$, generally plays out poorly for the Canadian index. The commodity market was perhaps the most bruised by the rate increase. The Commodity Research Bureau Index (CRB) saw a continuation of an existing downward trend. Stability or strength in the US dollar is often a negative for US priced natural resources. Bottom line: As the ball seems to be rolling for US interest rates, the impact on the Big dollar, however, still seems to be mute. The influence of the US dollar and rising interest rates can not be overstated. Though rising currency and interest rates signal a growing and strong economy, it also impacts the market as it makes American goods and services less competitive on the global stage which in turn impacts the stock market. 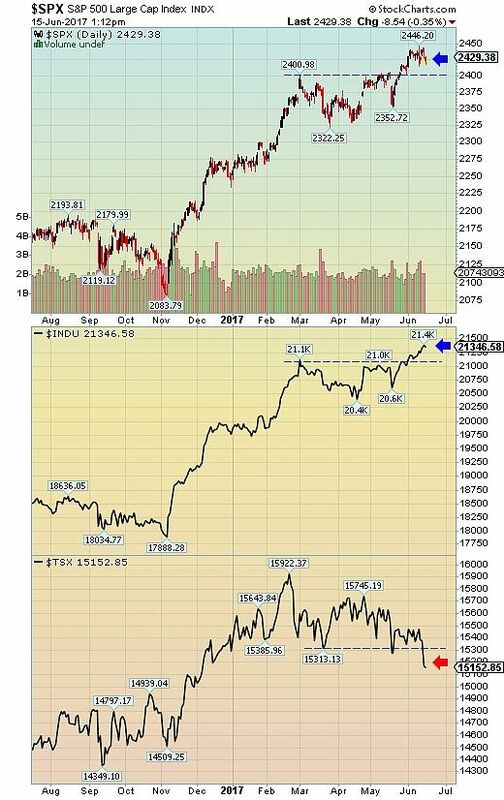 At this junction, we do not see any weakness in the equity markets and expect new highs to continue to develop over the next few quarters.